Just Can’t Get Enough Steve Kemp! The ball itself is not a regulation major league baseball. I acquired it when I was a paperboy for The Detroit News as a prize for selling new subscriptions. Note: The guys who sold a lot of subscriptions got prizes like bicycles and trips to Washington DC, but this was the best prize I ever got from them, so you can see how good a salesman I was. Still, I had various prizes to choose from and I picked the baseball. Like I said, it had no signatures on it at this point. A year or so later, my sisters B and E began attending autograph sessions prior to Detroit Tigers baseball games. I never accompanied them to these, but it was plain that they planned on attending them throughout the season. I proffered my baseball to sister E and asked her if she’d mind taking it with her whenever she attended an autograph session and filling it up with signatures. She obliged and by late in the season, it was covered with ink scrawls of varying degrees of legibility. There’s one sad part to the story: My sisters had been collecting their autographs on paper – notebooks of some sort, I assume, but they had not brought baseballs of their own. Sister E was a mere 14 years old at the time, and it was a tearful parting when she had to surrender the baseball to me. She briefly made an appeal to my compassion, hoping that I might let her keep the ball, but my 18-year-old heart had little compassion in it when it came to such matters. A deal was a deal, I reasoned, and so the ball came into my possession. The ball has seen little light in the intervening years, remaining mostly in storage, but my nephew A recently gave me a clear plastic display case, so the ball is finally on display in my living room (though never in direct sunlight) where any lucky guest may view it. 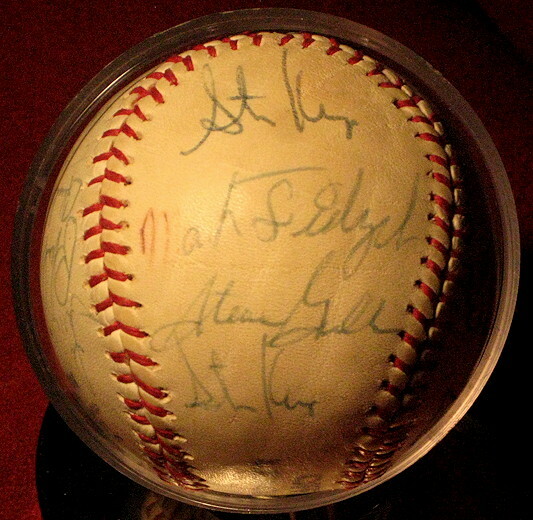 The autographs are from members of the 1977 Detroit Tigers. Because it was signed over the course of the season at various autograph sessions, quality control was a little spotty. The most obvious result of this may be seen in the above photo, which shows two separate autographs from Steve Kemp, who was a rookie that year. Also seen here are the signatures of pitchers Steve Grilli and the late, great Mark “The Bird” Fidrych. Another autograph on the ball is that of rookie pitcher Jack Morris, who stands a good chance of being elected to the Hall of Fame in a few weeks. So that’s cool. Thanks again, after all these years, to sister E for enabling me to possess this wonderful little sphere of memories. Man! You don't forget anything, do you?! A very long ago memory! I don't remember crying, or you even offering the ball to get the signatures. I was such a dutiful sister! I still have my box of baseball stuff mostly because YOU said I would throw it all away someday; well, that day hasn't come yet! Well, I don't want to take too much credit for my memory -- I had to do some research before I wrote this post. I showed the baseball to Dan and read him the names on it, by which he was able to tell me it was from 1977, and that Kemp and Morris were rookies. In fact, I have no memory of telling you that you'd throw all your baseball stuff away someday, but it sounds like the sort of rash pronouncement an opinionated 18-year-old me might have made. I'm glad you saw this post!